India saw the most improvement in its fixed broadband download speeds in 2018 among the world’s five most populous countries, according to Ookla’s 2018 review of internet speeds globally. The Ookla list looks at both mobile internet speeds and fixed broadband speeds across the world. In overall rankings, India stood 111 for mobile and 65 for fixed broadband per the Speedtest Global Index at the end of November 2018. Ookla’s 2018 year in the review showed that the world’s five most populous countries are notably absent from the lists of fastest and most improved countries in both categories of internet speeds. Norway had the world’s fastest mobile internet speeds, while Singapore topped the list of countries with fastest broadband speeds. Coming to the five countries with nearly 46 per cent of the world’s population, this includes China, India, US, Indonesia and Brazil. In this segment, China had the highest mobile internet speeds, while US had the highest fixed internet speeds. India’s fixed broadband speeds stood at 23.00 Mbps, which was a 50.4 per cent improvement. India was number three in this list of five countries, ranking above Brazil and Indonesia. 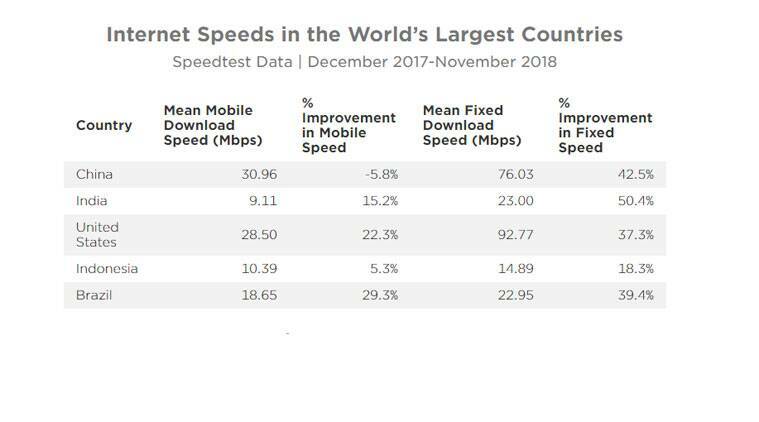 In mobile internet, the mean speed for India stood at 9.11, which puts it at the bottom of these five nations, and shows there is a long way to go before speeds catch up. While India’s mobile internet speeds improved 15 per cent, it was clearly not good enough to beat the other four countries in the list in terms of the overall average. China has the fastest mobile average speed among these five nations with a 30.96 Mbps, but improvement in mobile speeds was down by 5 per cent in the country. The US had the highest fixed internet speeds among these nations at 92.77 Mbps with 37.3 per cent improvement. Ookla’s data showed that the world’s average mobile download speed stood at 22.82 Mbps, which is an increase of 15.2% over the past year, while mobile upload speed increased 11.6% to reach 9.19 Mbps. Fixed broadband speeds were nearly twice as fast as those on mobile in 2018, according to Ookla. “The world’s average download speed on fixed broadband was 46.12 Mbps, 26.4% faster than last year. Upload speed increased 26.5% to 22.44 Mbps,” notes the report. It also looks like iOS devices had faster mobile internet speeds compared to iOS. Ookla points out that the reason for this is that Android dominates in emerging markets, where internet speeds tend to be slower. But the study does say that download speeds on Android devices increased 19.0% and upload speed increased by 15.1%, which is more than those on iOS. The countries with the fastest mean download speeds over mobile in the past 12 months were: Norway (63.19 Mbps), Iceland (58.68 Mbps), Qatar (55.17 Mbps), Singapore (54.71 Mbps) and the Netherlands (53.42 Mbps). Oppo is set to bring the Find X to India on Thursday, July 12.